Artificial intelligence (AI), especially Deep (Machine) Learning applications, are already ubiquitous and in everyday use, and have been called the second industrial revolution. Deep Learning algorithms, called Neural Networks, thrive on Big Data. The happy ‘problem’ we now face of enormous amounts of data available in this digital era. In astronomy too,telescopes will soon routinely produce terabytes of data every night. Piggybacked on the impressive recent advances in high performance computing, neural networks are trained on these available large datasets to then perform a variety of human-like tasks, such as real-time decision making, identifying subtle patterns in the data, forecasting and making recommendations based on experience, and so on. In this presentation I aim to provide an overview of this rapidly burgeoning field, explain in simple terms the construction and working of a neural net, and illustrate these principles with a working model. Dr. Karun Thanjuvar: As an observational cosmologist, discovering new gravitational lenses and developing innovative techniques to harness them as observational tools are amongst my diverse research interests. As part of my doctoral thesis at UVic in 2009, I developed an automated technique to search for lenses in wide field, pan-chromatic imaging. These explorations of the distant universe come after a full career as a mechanical engineer, specializing in control systems and robotics. 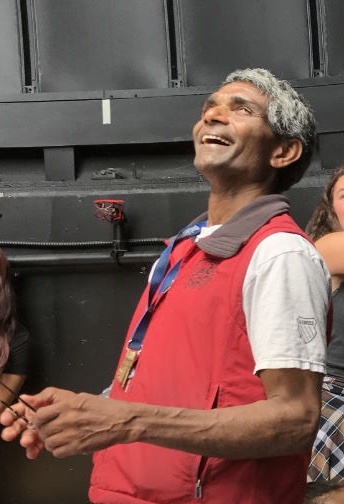 Born andraised in a small town in South India, I completed my education up to a bachelor’s degree in mechanical engineering there, before moving to Canada to pursue graduate studies; first in Robotics, and later in Astrophysics. After my PhD from UVic, I worked as a Resident Astronomer at CFHT in Hawaii for three years, before returning to UVic to accept a position as a senior lab instructor in astronomy. Even though undergraduate teaching is the focus of my current position, I continue to pursue various research projects. 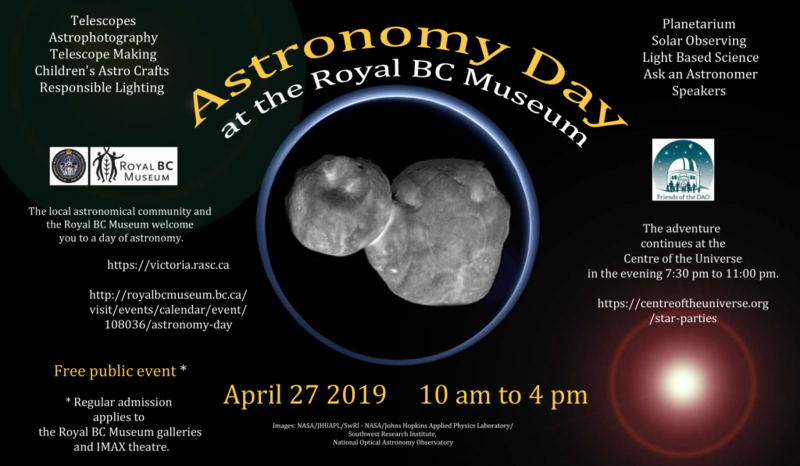 I also enjoy sharing the excitement of science and my research efforts with the public through several outreach initiatives through the UVic observatory. The Victoria atmosphere has finally acquired some Spring like qualities. This means that it is almost time to launch the 2019 Public Outreach Season. The official kick off takes place on Saturday April 27th with Astronomy Day. From 10AM to 4PM the Victoria Centre will be hosting the session at the Royal BC Museum. Numerous tables devoted to all things Astronomical will be located in the Clifford Carl Hall. Three lectures will be delivered in the adjacent Newcombe Conference Hall. David Lee, the captain of the Astronomy Day Team has recruited leaders to organize the various tables and things are coming together nicely. From 7:30PM to 11PM, our cousins, the Friends of the DAO, will be hosting the first Saturday Star Party of the season at the Dominion Astrophysical Observatory. RASC members will be in force with their telescopes to act as tour guides of the Universe. 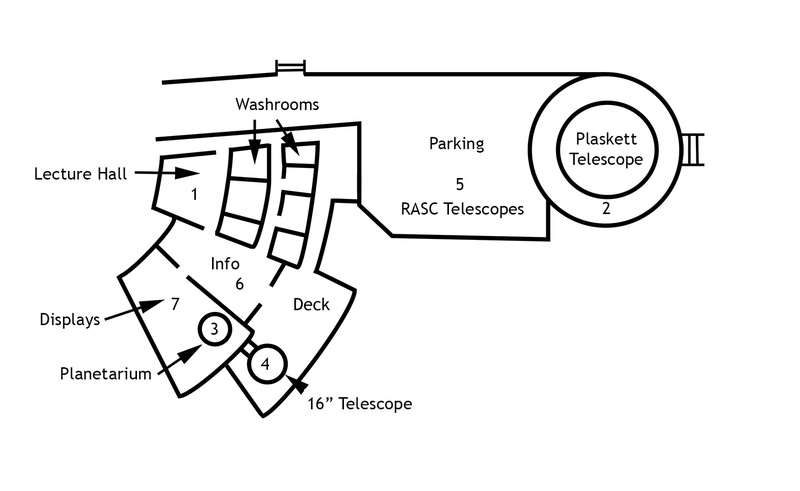 RASC will also have an information table in the Centre of the Universe. Star Parties at the DAO will be held every Saturday until September 7th. Victoria Centre usually hosts another type of Star Party each year. 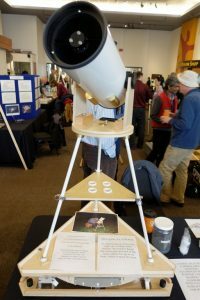 The main focus of this event is an observing session directed toward the community of amateur astronomers rather than the general public. Selecting the date of a Star Party can be a challenge. It should meet the following criteria: fall near a New Moon, have a sufficient amount of darkness, avoid conflict with other nearby Star Parties and … oh yes … enjoy favourable weather conditions. This year the Mount Kobau Star Party, near Osoyoos will take place between July 31st and August 4th and the Island Star Party, held at Bright Angel Park in the Cowichan Valley, will occur on the Labour Day weekend. 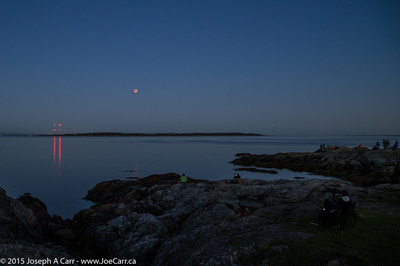 Many Victoria RASCals are loyal attendees of the Island Star Party so it is best to avoid that weekend. The New Moon and amount of darkness are easy to predict. It is, however, a bit trickier when it comes to the weather. The saying goes that climate is what you expect and weather is what you get. While climate statistics can let you down it does reveal that the atmospheric dice are loaded. One rudimentary statistic which has proven useful in this area is the chance of 5 consecutive days without rain. The premise is that if there is no rain during a 5 day interval it suggests the presence of a ridge of high pressure that is diverting weather systems away from the area and suppressing afternoon shower activity. Using 50 years of quality controlled precipitation data from Victoria International Airport I calculated that the chance of 5 consecutive days without rain varied from 65% on Aug 1st to 47% on Sept 1st to 29% on Sept 28th. These values suggest that favourable weather conditions may be more than twice as likely on August 1st than during the New Moon interval near Sept. 28th. During the last three summers, however, smoke from wildfires has frequently obscured the night skies during July and August. Also astronomical twilight ends at 8:43 PM on Sept. 28th compared to 11:13PM on Aug. 1st. As a consequence the Council is leaning towards holding the Victoria Centre Star Party from Friday Sept. 27th to Sunday Sept. 29th. The location will once again be the yard of St. Stephen’s Anglican Church in Central Saanich … which was rained out on Sept. 7th last year. Be wary of those climate statistics! Normally at the beginning of March Victoria Centre RASCals are trudging through cherry blossoms. Snow is not an option. So just imagine your puzzled president when he arrived at the VCO on February 27th. The observing pad was covered with 6 inches of white stuff topped with an icy crust. This unseasonably cold weather tormented tender West Coast RASCals throughout February and almost derailed the Mini AGM of February 13th. Mini AGM you say? This administrative AGM resulted from trying to make others happy. To streamline financial procedures the Canadian Revenue Agency wanted the Victoria Centre to move our fiscal year end from September 30th to December 31st. When we did that the BC Societies Act insisted that we hold an AGM in 2019. So this “administrative AGM” which covers the three month interval extending from October to December 2018 was scheduled to coincide with the February monthly meeting. This would make the CRA happy and the BC Societies people happy … but there was a problem. It all has to do with our bylaws. When the bylaws were recently updated the quorum was boosted from 3 to 25. The architects of these new bylaws never envisioned that the “Garden City” would be paralyzed by snow. Since North Saanich was buried under 2 feet and many members were trapped in unplowed cul de sacs it was looking like the Mini AGM was toast. Fortunately these very same bylaw architects included a provision for proxy votes. At the last minute your desperate president e-mailed the membership with a plea for proxies. The first proxy arrived from Tasmania! Nearby RASCals also rallied to the cause. A quorum was established and the first Mini AGM in the 104 year history of the Victoria Centre went ahead. Let us hope that it will also be the last Mini AGM in history as this bureaucratic process is more complicated than astrophysics. Speaking of “astro” things let’s talk about AstroFest 2019. This event, the first of its kind, was held in Nanaimo on February 28th. 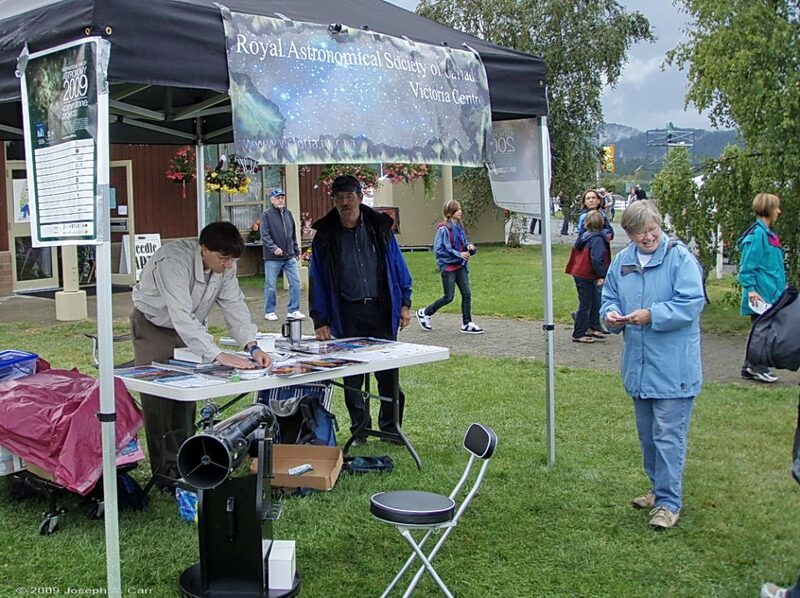 It was extremely well organized and hosted by the Nanaimo Astronomy Society. The idea was to bring Island astronomers together to share their knowledge and enthusiasm. This mid island rendezvous was well advertised and over 120 attended the event. Nelson Walker, Bill Weir and I manned the Victoria Centre table while Lauri Roche and Ben Dorman represented the FDAO. Victoria Centre RASCal Francois Pilote led a contingent of 5 from the Comox Valley and Victoria member Mike Krempotic came from Port Alberni. Dennis Crabtree set up the very popular virtual reality system and captivated many. There were a number of presentations. I provided info on the Victoria Centre while Nanaimo President Chris Boar described the activities of the Nanaimo Society. 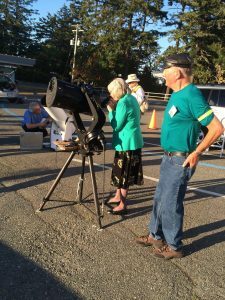 In addition to talks at their monthly meeting they hold many outreach events and like Victoria are swamped by the curious public during eclipses. They also take time to have fun and schedule an annual Beer and Burger night. 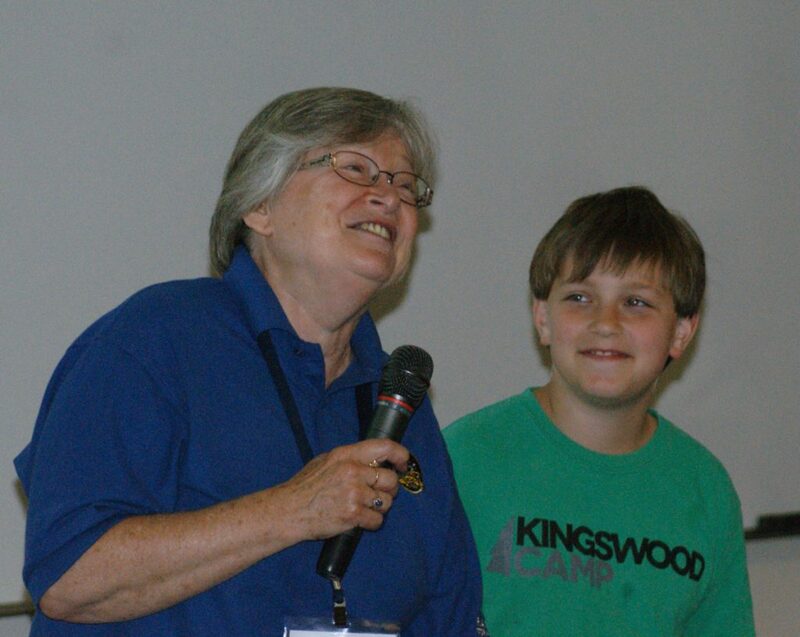 The Cowichan Valley Starfinders promoted their star party and Nigel Mayes from Shawnigan Lake School described their facility and active astronomy program. John and Carol Nemy delivered a spectacular visual presentation of the night sky which featured their Island Stars Observatory located on Hornby Island. The members of the Nanaimo Astronomy Society were very friendly and hospitable. Several members had roll off roof observatories. Many of the attendees were newbies looking for ways to get involved in Astronomy. Bruce Lane from Quarky Science donated a nice pair of binoculars as a door prize. There was great enthusiasm for this event and it is hoped that it will be repeated. Special thanks must go to Chris Boar, Tony Puerez and Janeane MacGillivary for magically making it all happen. On January 1st, 2019 NASA’s New Horizons spacecraft executed a flawless encounter of the small world provisionally known as 2014 MU69. Our understanding of the nature of the outer solar system and processes of planet formation have been transformed by the very first resolved images of 2014 MU69. Now, 2 months after encounter, the imaging and spectroscopy from 2014 MU69 continue to trickle in. I will describe the processes that enable this historic encounter to occur and the initial results from the spacecraft imaging. Dr. JJ Kavelaars received his Ph.D. from the Department of Physics at Queen’s University in Kingston ON in 1998. He is an Astronomer at the Dominion Astrophysical Observatory in Victoria and is a member of the Canadian Astronomy Data Centre. 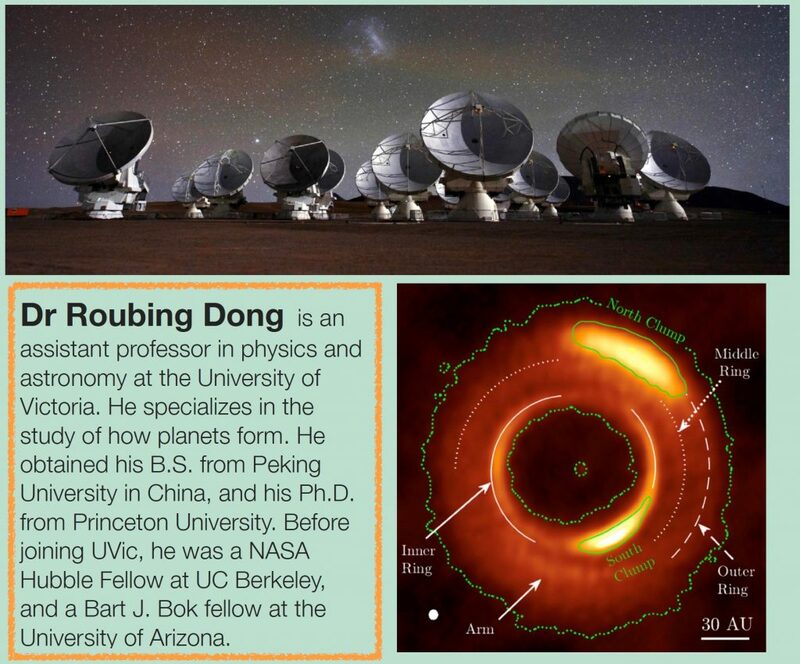 His areas of interest include the outer solar system including the Kuiper belt. This specialty enabled him to assist in selecting a followup target for the New Horizons spacecraft after it flew by Pluto. While studying irregular planetary satellites JJ and his team discovered 23 moons surrounding Saturn, Uranus and Neptune. In 2016 he discovered the sixth dwarf planet in the solar system. Abstract:Over the last couple of years, there have been many headlines about the possibility of an undiscovered giant planet in the outer reaches of our Solar System. But is it real? Dr. Sam Lawler will lead you through the wilds of the distant Kuiper Belt with a surprisingly digestible (we promise!) discussion of orbital dynamics, observation biases, and dwarf planet discoveries. 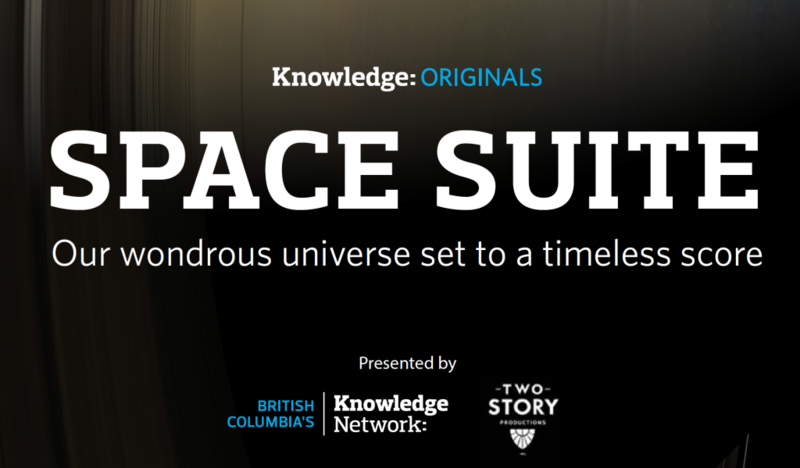 She will show you the latest discoveries from a large international collaboration, including astronomers right here in Canada, and you can decide for yourself whether or not you believe in Planet 9. Sam Lawler received her B.S. in astrophysics from Caltech, followed by 2 years of research work at Caltech’s IPAC facility on early Spitzer data of debris disks. She then received her M.A. from Wesleyan University before coming to Canada for her PhD work at UBC. 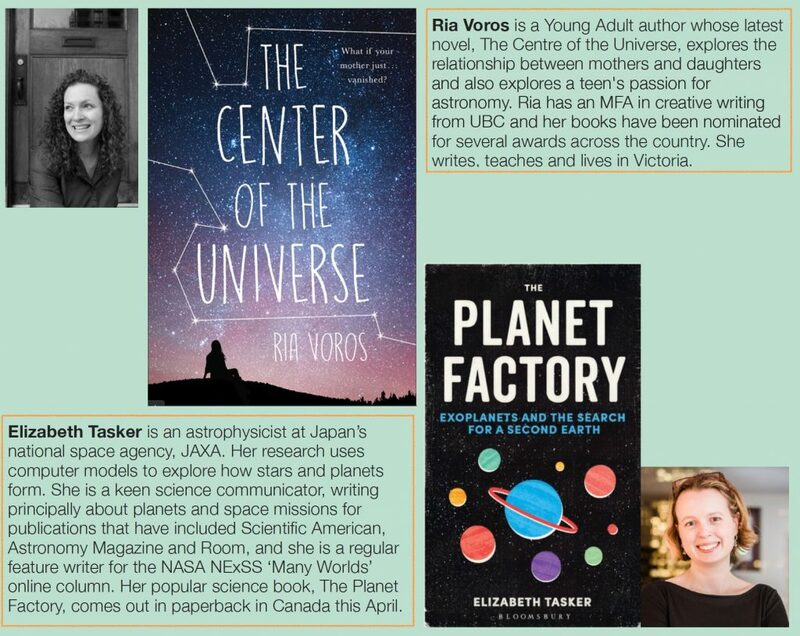 She has been in Victoria ever since her PhD, initially as a UVic postdoc/lecturer, and since 2015 as a Plaskett Fellow at NRC-Herzberg. Her work utilizes dynamical simulations of the effects of planets on debris disks and on the structure of the Kuiper Belt. Several of her recent projects involve dynamically testing the existence of reported planets. She has shown tau Ceti’s reported planet system is allowed by its wide debris disk, Fomalhaut b is likely a catastrophically disrupted icy body, and the structure of the Kuiper Belt does not require an additional distant planet in the Solar System. While her dynamical simulations are running on the computer cluster, she likes to play with her kids and grow food. For much of the astronomical community 2019 came barreling in at 50000 km/h. It was like they were riding in the back seat of New Horizons urging it to capture great shots of Ultima Thule as it whizzed by on New Years Day. The data slowly trickled in as the feeble signal completed its 6 hour journey home. To the amazement of all a strange snowman like feature emerged. During January this image became crisper as more data was accumulated. This technological triumph was a great way to begin the year. One of the team members that selected this Kuiper belt object, officially named 2014 MU69, was Victoria astronomer Dr. JJ Kavelaars. He is the scheduled speaker at our March monthly meeting and JJ will have the latest information to share. 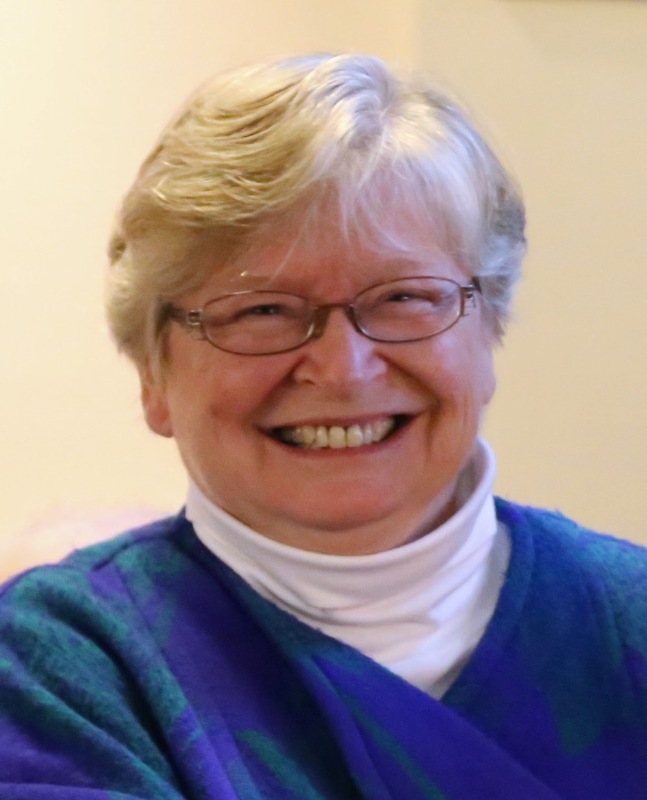 At our February monthly meeting Dr. Samantha Lawler will deliver a presentation on even more remote Kuiper belt objects and she will examine the evidence for a mysterious Planet Nine or maybe that should it be Planet Nein? January is not renowned for great observing conditions. 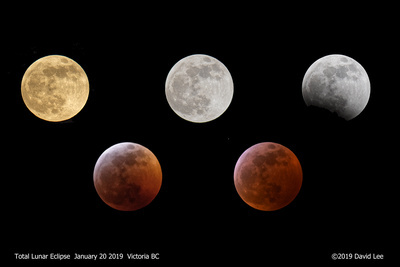 During the late afternoon of Sunday January 20th, however, skies magically cleared in the Victoria area and set the stage for a beautiful lunar eclipse. A fireball and a fleeting impact on the lunar surface were also witnessed by a lucky few. Due to its brightness I generally avoid observing the full moon but at this phase the ejecta rays of craters like Tycho and Copernicus were prominent. I adjusted my camera to highlight these striking features during the event. My optimum settings with a 127 mm refractor varied from 1/1250 second at ISO 100 at the beginning to 4 seconds at ISO 800 during totality. This remarkable reduction in intensity enabled one to enjoy a rich star field during totality. I observed the eclipse at Cattle Point Urban Dark Sky Park. The parking lot was full. The atmosphere was joyous with occasional outbreaks of wolf howls to honour the Super Wolf Blood Moon. It was wonderful to share this event in community. This eclipse has inspired a number of RASCals to attempt the RASC lunar observing programs. These in include an introductory program entitled Explore the Moon and a more comprehensive program called the Isabel Williamson Lunar Observing Program. So far only 18 RASCals nation wide have completed the Isabel Williamson challenge. Perhaps you will want to join Victoria’s own Nelson Walker in this elite group. Check it out! 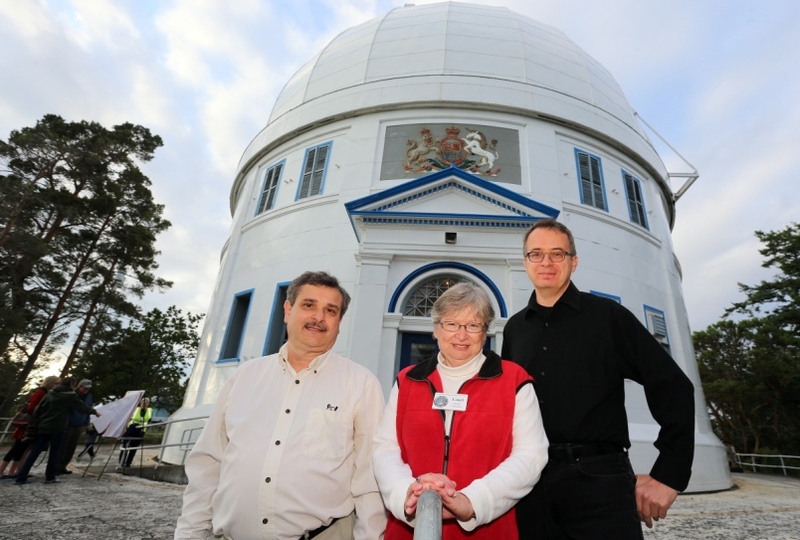 Some changes have been made at the Victoria Centre Observatory. The Victoria Centre recently received a generous donation of a 20 Inch Obsession Dobsonian telescope. In order the accommodate this scope at the VCO the existing 20 inch Dobsonian has been relocated to the Center of the Universe. This scope was beautifully crafted by Guy Walton in 2003 using a mirror from Jack Newton. In addition to serving as a museum piece this scope will be rolled out on the patio and used for public outreach events. RASCals are reminded that during our February 13th Monthly Meeting there will be a very short administrative “Mini AGM”. This meeting is required as a result of the recent change of our fiscal year end from September 30th to December 31st. This could take less than 5 minutes so bring your stop watches! On Sunday, January 20th, 2019, we will be able to view a total eclipse of the Moon (weather permitting). The Moon will be in partial phase after rising from the eastern horizon, and move into full eclipse in evening hours as it climbs in altitude and moves to the southeast. The Total Lunar Eclipse will develop over the course of about 3 hours, will be in Totality for about an hour, and will end just before midnight. This is a perfect opportunity to visually observe this beautiful celestial event, and possibly capture some photographs from a location with an unobstructed view to the east and south. Above Eclipse times are for Pacific Standard Time (PST) for the west coast of North America, and are calculated from UT as presented in the Observers Handbook 2019, pages 127-29. Find yourself a location that has a clear horizon view to the east and south especially if you wish to view during the late stages. A good observing project for this long-lasting eclipse will be to observe the craters on the Moon as the eclipse progresses. Craters will be immersed and emerge from the Earth’s shadow on the Moon at times specified in the Observers Handbook 2019, page 129. Smartphone cameras typically do not support manual settings, so using them to capture a lunar eclipse will be less rewarding than using more capable cameras. That said, smartphone cameras can be held up to a telescope eyepiece to capture an image of the Moon. Aligning the tiny lens to the eyepiece can be tricky, however there are platforms made to clamp onto an eyepiece barrel which will hold smartphones steady enough to take acceptable photos of the Moon, including the eclipsed Moon. The simplest eclipse pictures can be taken with manual settings on your camera and a normal lens, preferably supported by a tripod. For best results use a cable release to minimize vibration. Images taken in this fashion result in a small lunar image. This is why it is preferable to use a telephoto lens to photograph the Moon. For a full frame camera try a 200mm lens or something close to this, even better a 500mm lens or higher. You may also use teleconverters to increase magnification, these typically come in 1.4x and 2x strengths. Their downside is they reduce the effective aperture of your optical system. A 1.4x teleconverter will decrease your effective exposure by 1 stop, a 2x teleconverter will decrease your effective exposure by 2 stops. Work out your effective aperture of your optical system ahead of time so you don’t have to think about it on the night of the eclipse. Note for the smaller sub-full frame sensors of some digital cameras you gain an extra advantage as the focal length of the lens is effectively magnified by a factor. For example a Nikon DX body your 200mm lens would be effectively 300mm. To achieve any higher magnification than what is stated above you will have to use a telescope at prime focus. For this your manual camera does need to have the capability of using interchangeable lenses. For prime focus you will use the telescope optics as your interchangeable lens. To attach your camera to your telescope you will need two things a T-adapter that fits your camera and a telescope camera adapter that fits your telescope. The telescope camera adapter is designed to fit in the focusing tube of your telescope and is threaded to accept the T-adapter of your camera. With the magnification involved with telescopic optics it is likely that you will need to use a tracking mount. Preferably the mount should be able to track at lunar speed as opposed to sidereal but if the shutter speeds chosen are shorter than 1 or 2 minutes this is not critical. Exposure times are the next consideration. The following exposure times are based on a medium ISO setting and an effective aperture that would be common with a long telephoto and teleconverter combination. Exposures may vary with your equipment based on ISO speed and effective aperture. The Danjon Lunar Eclipse Luminosity Scale has been included to provide better guesstimates for totality. 1st Contact 1/250 second at f/16 see note 1. 2nd Contact 1 second at f/16 see note 2. 3rd Contact 1 second at f/16 see note 2. 4th Contact 1/250 second at f/16 see note 1.